You know those cheeky moments when your kids sneak up to the kitchen bench, quickly grab a goodie, duck out of sight behind the fish tank whilst gobbling up that mouthful of sweetness? Well, these peppermint creams are worthy of such cheeky moments. Be warned, this recipe makes a batch of super sweet peppermint creams. Guard them with a watchful eye, lest they mysteriously disappear whilst you’re washing up the dishes. 1. Place icing sugar, egg white, lemon juice into a mixer and mix until the icing becomes a soft dough texture. 2. Add the peppermint essence and green food colouring to the mixture and blend for a few seconds, until the colour is evenly distributed throughout the dough. 3. Line your kitchen bench with baking paper and place the the icing mixture onto it. 4. Roll out the icing mixture to about 1cm thick. 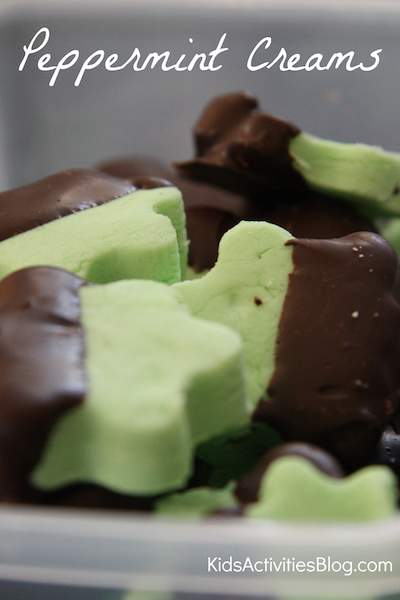 Using a cookie cutter, cut out shapes for your peppermint creams. 5. Let the peppermint creams set in a cool, dry place. 6. When the peppermint creams have hardened, melt some cooking chocolate into a small bowl. 7. Dip part of the peppermint creams into the melted chocolate. This was our favourite part of the recipe. Eyes lit up at the sight of melted chocolate. Memories of our [m] is for mixing cooking experience flooded their minds; stories of writing in melted chocolate, custard and condensed milk made us all smile. 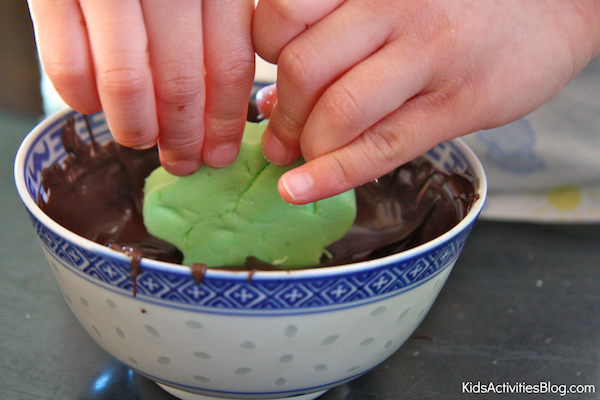 Little fingers quickly worked at covering the peppermint creams in chocolate ; they wanted to finish the remains of the melted chocolate themselves. It was a good thing they wanted to work quickly because as the melted cooking chocolate sets, it becomes harder to work with. 8. 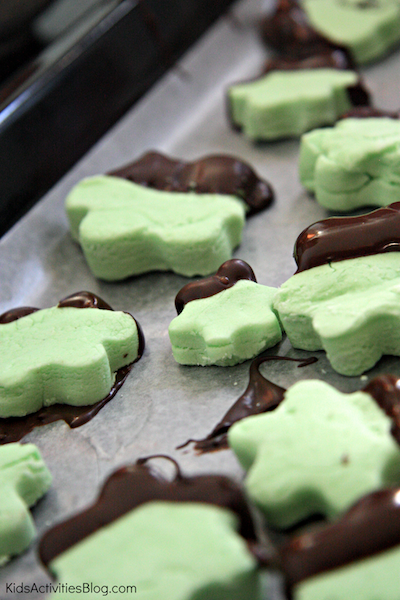 Place the partially chocolate covered peppermint creams on some waxed paper to set. Guard the peppermint creams whilst they are setting from cheeky little monkeys! Ohh I love these and they make such a great gift for friends, neighbours and family. 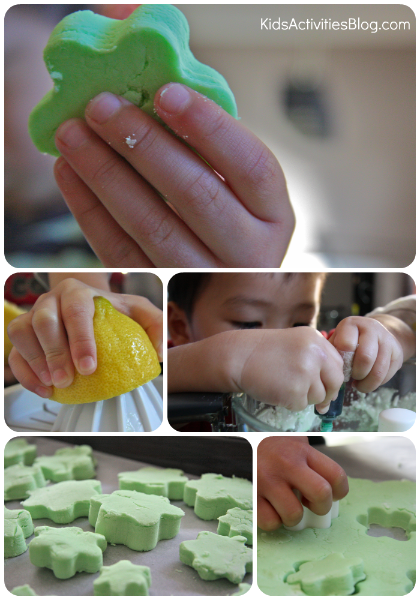 I wasn’t too sure if MY kids would like them as they seem to dislike ANYTHING GREEN (they resemble vegetables – oh no!) – lol. They loved these green mouthfuls though. Yep, spoiler alert to my friends, neighbours and family.. tee hee hee. Makes my mouth water just looking at them! I have put a link to your blog on my latest blog http://www.pudsyoulike.co.uk/my-top-5-recipes-for-july-cooking-with-kids/ hope you can share.